Greeting cards play a significant part in our life. It is the most beautiful way to keep in touch with your loved ones. Nothing touches hearts better than a beautiful greeting card with a personalized message. From the business point of view it is very important; it helps to strengthen the relationship. It is a nice way of wishing and thanking your privileged customer. The customer on their part will feel special and going to remember you when it comes to buying the product and service. There are numerous occasions when you can send greeting like New Year, Christmas or on other important events. We, at S S Graphics have a team of highly skilled and creative greeting card designers, who will design season greeting cards keeping in mind your company’s grandeur. We offer you full customization option, you can choose the design, font, and get personalized message. The end result is always captaining as we use the latest technology advanced printing equipment, and supreme quality paper to print greeting cards, so reinforce your personal and professional bond with our seasons greeting cards. Greeting Cards Printing is Easy! It is undeniable that greeting card marketing helps to secure long-term business relationships and establish customer loyalty. You can design different greeting card printing projects to produce different types of greeting cards to have an unforgettable positive impact on your clients. One can use custom greeting cards to tell past customers "thank you" for their business or Promote an upcoming event or sale with a greeting card campaign or send greeting cards on special occasions or festivals such as Christmas, Thanksgiving or Diwali. 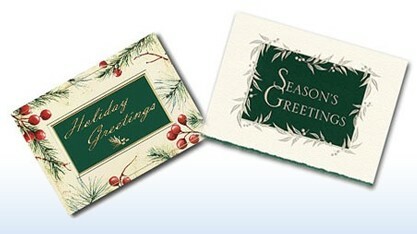 Greeting cards may be used even to ask customers for feedback or for a referral or can serve as invites, RSVP cards. You can customize greeting cards to your benefit with our custom greeting cards printing for a more personal touch.